There are a lot of things that can go wrong when you write and sell ebooks. That’s why I created the list below. You may discover several areas where you need to improve, but don’t get discouraged. This list is meant to help you get better. I’ve probably made every single mistake on this list, and I still make some of them, but I keep moving forward and getting results. You don’t have to be perfect in order to get paid to do what you love. Without testing, you could waste months or worse yet, years writing an ebook nobody wants. Before you start, test your idea. Write blog posts, do free coaching, or run a paid webinar. See if anyone is interested. If they aren’t, tweak it or move on. The key is to test your idea in the real world as soon as possible. Stop looking for niches where there’s no competition. There’s often a good reason no one is in that market in the first place. Instead, find the intersection between what you want to do, what you’re good at, and what people are willing to pay for. Not just any problem, but a problem that people are willing to pay for. This may not be clear right away. Look at what’s already out there and go from there. Is it clear why people should buy your ebook? Positioning could mean that your ebook is meant for a specific type of person, such as new moms. It could mean that it’s for a very specific problem, such as getting rid of post-pregnancy weight. How you position your ebook doesn’t have to be revolutionary like so many people have you believe, but it’s better to have it there than not have it at all. What results will people get when they apply the information in your ebook? All too often, ebook authors don’t make a strong promise, because it puts the risk on them. But if you want your ebook to sell well, you have to make a promise. The good news is that once you do, not only will you sell more copies, you’ll also have an easier time writing your ebook, because you’ve got a goal. I’ve found that the more passionate I am about something, the more likely I am to succeed. Obviously, you can hate what you do and make a lot of money, but it’ll only end up killing you from the inside out. Find the intersection between what excites you and what people are willing to pay for and you will dramatically increase your chances of success. If nothing else, you’ll at least enjoy the journey, which is what life is. Does your ebook have structure? Does it go through things step-by-step so people don’t get confused? I focus a lot on making my ebooks, products and workshops as simple and structured as possible. It helps my customers use less brain power and achieve more. In the end, that means more results for them, which makes me happy. How you price your ebook will determine how successful it is. Most people tend to focus on ability to pay when the other factors may have more impact. Remember, you’re not just selling digital words. You’re selling a solution to a problem they’ve (probably) had for a while. Writing your ebook is just the first part of the process. You have to know how to market your ebook and get people interested. Yes, some ideas may sell themselves, but most do not. You have to tell people why they should buy, and you do that with a simple, ethical sales page. If you don’t know how to write one, you can learn. It’s a skill you’ll need if you want to start an online business. The technical bits can be a pain. They can screw up your ebook launch, so you have to make sure you pick a payment processor that is not only easy to use, but trustworthy and seamless for your customers. Most people use e-junkie and PayPal. You could also use a more complete solution like FastSpring. Will people get the ebook once they pay? Make sure you test the process. Most payment processors and systems will allow you to test everything for free. I often double and triple-check everything before launch. Unfortunately, people do judge a book by its cover. You don’t need fancy graphics, but you should make sure your graphics don’t look amateurish. You can create great graphics, or have someone else make them for you, without spending too much money. If you do it yourself, it’s easy if you keep it simple. I tend not to do graphics myself because it frustrates me. If you want to double (or more) the amount of copies you sell of your book, you have to build anticipation before you launch. Tell people that something is coming weeks or even months before you launch. Get people on an early-notification list. Or give people some teaser content leading up to the launch. If you don’t have an audience or an email list, chances are you won’t sell many copies of your ebook. Not at first. It’s tough to get other people to promote your stuff, especially if you’re new, which is why I recommend you build up an audience first. It doesn’t have to be big, but it’s better if you have one. 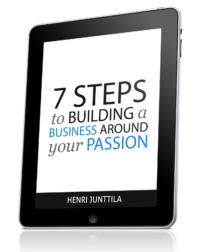 For example, I made over 4-figures with my first ebook with a list of just 700 people. Belief is the one big thing I see holding people back. You can write and sell an ebook, if you truly want to. You can build an online business that supports your lifestyle, if you’re ready to stop making excuses and start taking action. The biggest difference between the successful and the unsuccessful is how they think. Some make excuses, while others make progress. Your ebook should be good, but it doesn’t have to be perfect. Get it good enough and improve it as you go. Let people know that it’s the first version of your ebook, give them a good deal, and tell them you expect feedback. Forget about perfectionism and just take action. Get your ebook DONE! Why should people buy now? Sell the first 50 copies at an early-bird price. Give the first 10 buyers a free coaching session. You have to give people a reason to buy now, otherwise they’ll tend to put it off and probably never come back. You don’t have to be an expert, but you have to tell people WHY. It could be that you’ve been through it all and have personal experience. It could be that you’ve done a lot of research and helped friends. You don’t have to know it all. You just have to know more than your future customers. What file format is your ebook? You can’t just sell a Microsoft Word document. PDF is the most widely used format for ebook. Use PDF. You can easily convert documents to PDF nowadays both in Windows and Mac, or even online. Make it easy for people to consume your ebook. This goes hand in hand with perfectionism. Many ebook creators are afraid that people won’t like what they have to say, so they stuff their ebooks with information. They ramble on for hundreds of pages, and most people don’t care. All they want is to get results as fast as possible. You don’t have to give people a 200 page book. 40 pages are enough if it gets people the result you promised. There are a lot of mistakes you can make when creating your ebook. The list above may overwhelm you, and if it does, focus on just one thing at a time. I’ve made a lot of the mistakes above, and I still make many of them, so perfection is not necessary. So many people make it sound like your ebook has to be the best, but it doesn’t. Yes, it has to deliver value and help people, but it doesn’t have to be as perfect as you think it does. This comes down to taking action and getting your ebook done, because when that happens, you learn, tweak, and improve. No one creates a masterpiece on the first go. Another informative email. If you could give those of us with “paralysis of analysis” and “shiny object syndrome” a big boost with the simplest and most economical method to start an online biz it would be SUPER DOOPER – a step by step action plan would be great, too. I shall see what I can cook up! I haven’t heard anyone else experience that, and I double-checked, looks fine on my end.